The Bride & Groom will love wearing these sandals on their beach honeymoon or at their destination wedding. 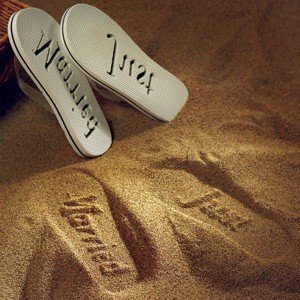 These bride and groom flip flops leave a fun 'just married' imprint in the sand. And if you are having a beach ceremony, consider giving your attendants a pair to wear at the wedding or around the resort. The black sandals are sized for him and the white ones for her. To determine the appropriate sandal size, measure your foot from toe to heel and add 1/2". Then, select the sandal that is the same or slightly larger. These are flip flops and do not require an exact fit. Black Medium - 11" from heel to toe. Black Large - 12" from heel to toe. Black XLarge - 13" from heel to toe. White Small - 9" from heel to toe. White Medium - 10" from heel to toe. White Large - 11" from heel to toe. What size should I order for mens size 11 or 11 1/2? 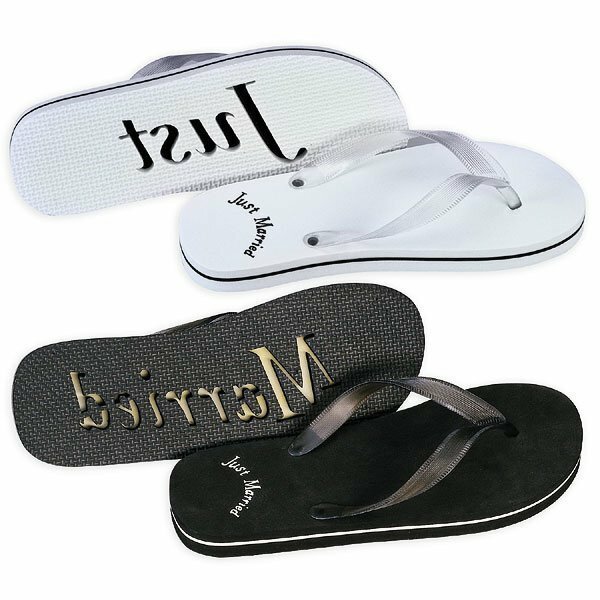 We don't have standard shoe sizes, but the length of the Just Married Bride and Groom Flip Flops are listed in the product description. what size would I order if the grooms shoe size is 11 or 11 1/2 flip flop? I'm sorry, we do not have them listed by shoes sizes due to the fact that this can vary.